What Knee Do I Need? 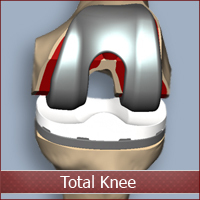 Knee replacement surgery is typically done for Arthritis of the knee. Simply, Arthritis of the knee occurs when the smooth surfaces of the knee become rough. The smooth surface at the end of the thigh bone, the top of the shin bone and behind the knee cap is called cartilage. In reality, it looks white and shiny and feels very hard just like a cue ball in the game of pool. 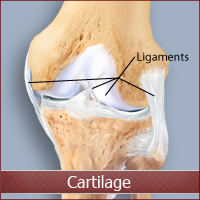 When the smooth cartilage becomes rough due to age or trauma most commonly, this is called Arthritis. I often think of taking rough sandpaper and sanding away the smooth white surface. Hopefully this gives you a picture in your head of why it may hurt so much! 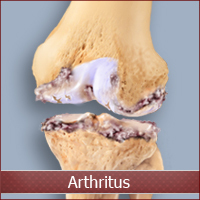 Check out this picture inside a knee with and without arthritis. I have always been troubled by the term “replacement”. And after performing several thousand knee replacements, that hasn’t changed. I feel like patients think we remove the end of the thigh bone and the top of the shin bone and actually put a new hinge in. In reality, we “resurface” or “remodel” the ends of the bones and replace the rough cartilage with smooth metal and plastic. Matching the curves and the motion of the knee as best we can. In fact, as a surgeon I do my best to save as much of your knee as possible, including the sparing of ligaments, bone, tendons, and the cutting of as little muscle as possible! What knee is right for me? In my experience, most patients are surprised to hear that there are options! First, it is important to do a little explaining about the knee, then to explain why there are options today. The thigh and shin bones come together to make the hinge of the knee. The knee cap is in front and the ligaments are on the sides and middle. 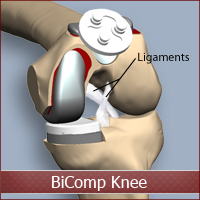 The knee is made of three parts or the technical term is compartments. The compartments are the medial or inside of the knee, the lateral, or outside of the knee and the knee cap and the groove that it rides back and forth in. 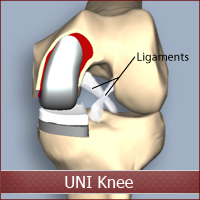 We have technology today that allows surgeons to replace all three of the compartments called a Total Knee Replacement, one of the compartments called a Unicompartmental Knee (a UNI) or new cutting edge technology that replaces two of the three compartments and is called a Bicompartmental Knee (a BiComp). The right knee for you has three main factors. They are age, activity level and most importantly which of the three compartments has arthritis. Interesting enough, arthritis can affect one, two or most often all three. Younger patients may have only one or two compartments affected by the arthritis and may be a candidate for a Unicompartmental or BiCompartmental Replacement. These are often referred to as the “Ligament Sparing” Knees because ALL four of the important ligaments in your knee are saved. While it might amaze you how much you can do with a knee replacement, a Uni or BiComp replacement may make those activities feel more normal and, frankly, may even get to the point where it feels like that old knee you loved for so many years! Which knee is right for you is based on listening to your story about your knee, examining the knee and finally an x-ray or MRI. An x-ray will tell the surgeon if the bones are getting closer together because the smooth cartilage covering is wearing out, the famous bone on bone arthritis. The MRI will actually show us the cartilage covering and help you and I create a thought out plan for your replacement and where it should be performed, in or out of the hospital. Traditionally, knee replacement or remodeling of the knee has been done in a hospital. The surgery took a couple hours, the hospital stay was several days and some patients required additional care in a rehabilitation hospital. Patients were often older and had more medical problems that required the safe care of a hospital. Today I can perform most knee replacements in less than an hour, through smaller incisions and have created an accelerated outpatient recovery center and program for patients to get home quicker! For more about benefits of the Outpatient Surgical Recovery Suites or to find out if you are a candidate, click on the link below! Where should I be 3 weeks after knee surgery?